I was featured on Miz Helen's Full Plate Thursday for my Hot Sauce recipe. Thanks Miz Helen! Last week on Facebook I mentioned that I had made Biscuits & Chocolate Gravy for Diva's breakfast. I know. Coolest. Momma. Ever. At the request of one of my readers, I am divulging this top secret recipe. Not really. I mean, I am divulging the recipe but it's not top secret. A friend in high school mentioned that his Granny in Arkansas used to make him some of his favorite foods like fried spam sandwiches and biscuits with chocolate gravy. 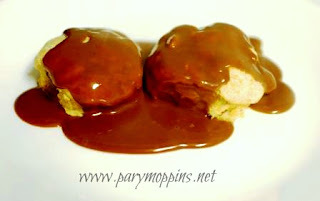 I could do without the spam >blech!< but the chocolate gravy sounded vedy intedresting. He didn't have his Granny's recipe and I never could get him to remember to ask her. After awhile, I forgot about it altogether. It was probably for the best since it would have done me no good then anyways. I too was in high school and didn't actually learn to cook anything edible until I was 23. But years later, I was driving down the road listening to the radio when someone called in to the station with their chocolate gravy recipe. I am not exaggerating when I say I pulled my car to a screeching halt on the side of the road and jotted down her basic instructions. Keep in mind, you could sift and such but as I am a dump cook, I tend to just throw it all in one pot. You dirty up less dishes that way. 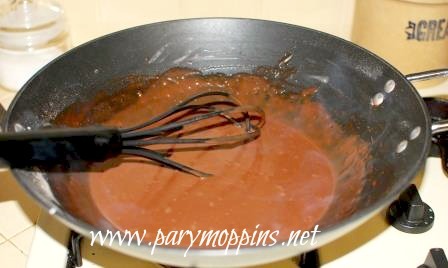 If you have any gravy left over, just reheat it slightly and dip strawberries into it. Or pour it over waffles. Turn the burner on medium and slowly add in the milk (and coffee if using it), whisking all the while. 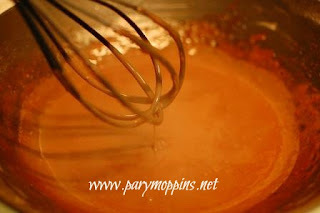 Once the gravy reaches the desired thickness, turn off the heat. Stir in the vanilla and butter. Serve over hot biscuits.